Then, there are frozen family dinners, many of which taste good but contain strange-looking ingredients and can have an odd texture from being frozen. 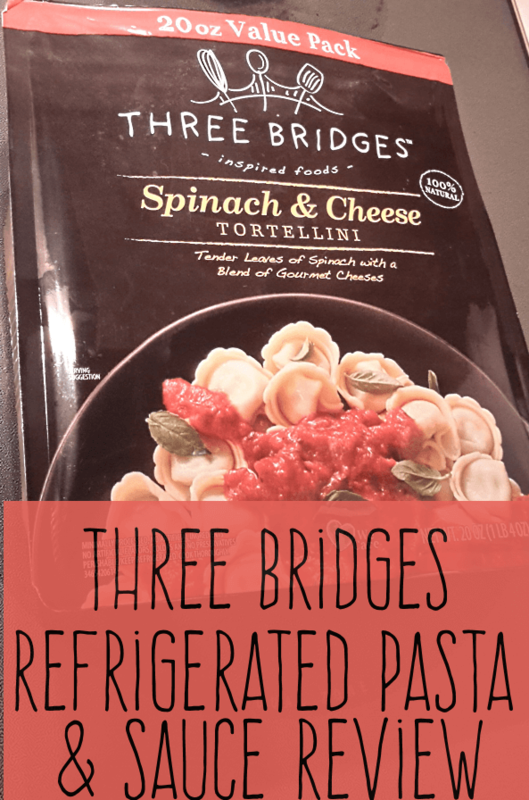 Fortunately, Three Bridges has just the thing for quick, healthy meals for your family with their refrigerated pasta and sauces. 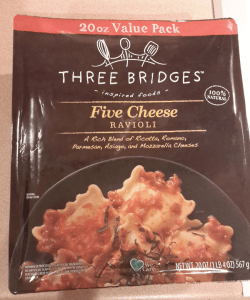 I received samples for review purposes, and my family enjoyed the Three Bridges pasta and sauce. The five-cheese ravioli was a child favorite, with both my 6-year-old and 11-year-old requesting second helpings. Its ingredient list contains real, recognizable food, like mozzarella, ricotta, Romano, Parmesan and Asiago cheeses. I thought the ravioli tasted just like homemade. I made the mistake of not removing all of the ravioli when the cooking time expired, so the last couple of servings were a bit too soft. 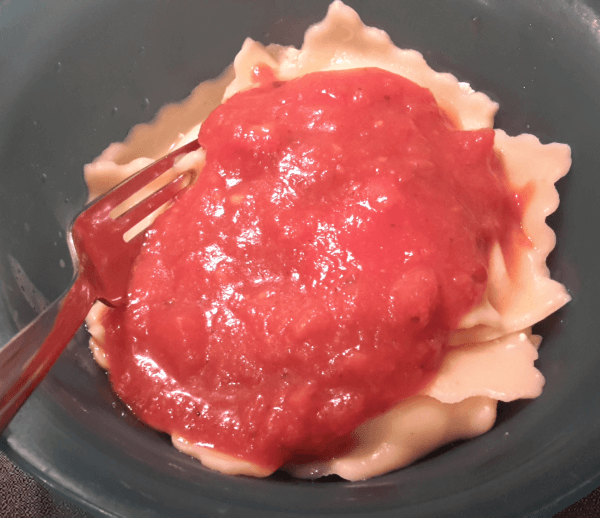 However, the kids had no problem devouring even the slightly overcooked ravioli. Both kids tried and enjoyed the spinach and cheese tortellini, even my older daughter who claims to dislike spinach. She tried it and liked it even though she knew it had spinach in it. We also liked the chicken and prosciutto ravioli, which tasted somewhat more spicy than the other pastas. My older daughter refused to try it because she didn’t like the sound of “chicken and prosciutto,” but my younger child chowed down with gusto. You’ll want to buy multiple packages of Three Bridges pasta, particularly the cheese ravioli, if you want to avoid squabbling with the kids for the last few pieces. 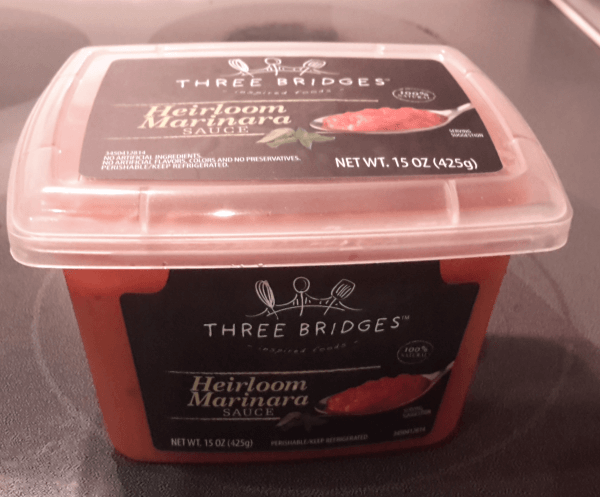 The girls really loved the Three Bridges Heirloom Marinara sauce with their pasta, which tasted a lot like homemade pasta sauce with a rich, tomato flavor. With very little spicy taste and a touch of sweetness, it’s just the kind of sauce most kids would prefer. 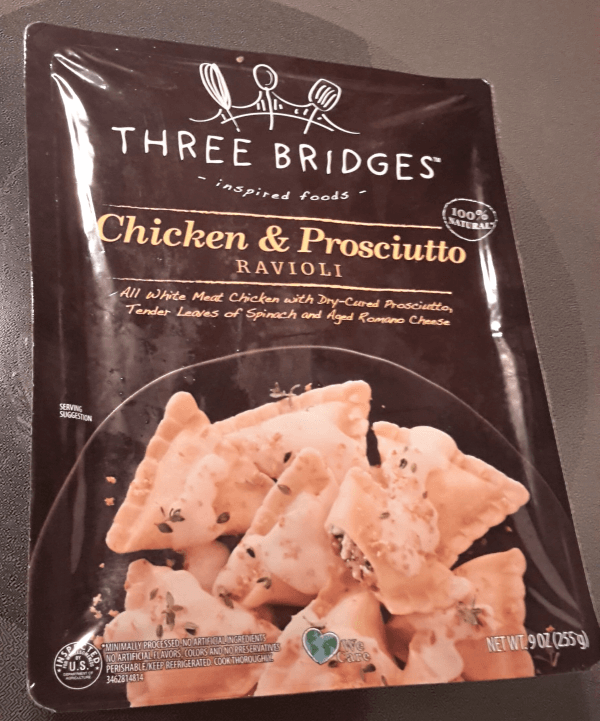 I used the delicious Three Bridges refrigerated basil pesto sauce in a baked Italian chicken recipe, which tasted delightful. The pesto sauce itself had a nice, fresh basil smell. 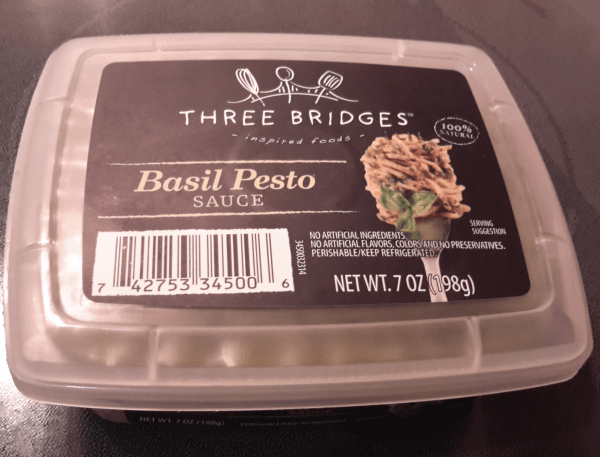 Three Bridges offers other sauces, too, such as creamy red bell pepper, porcini mushroom Parmesan Alfredo and Alfredo. Their additional pasta options include butternut squash ravioli, lobster ravioli, Italian sausage ravioli, Parmesan gnocchi, chicken and mozzarella ravioli, sausage and basil lasagna with zucchini and mozzarella cheese, butternut squash mac and cheese, Bolognese pasta shells with smoked mozzarella, chicken paella, sausage and jalapeno mac and cheese and spinach and cheese ravioli. 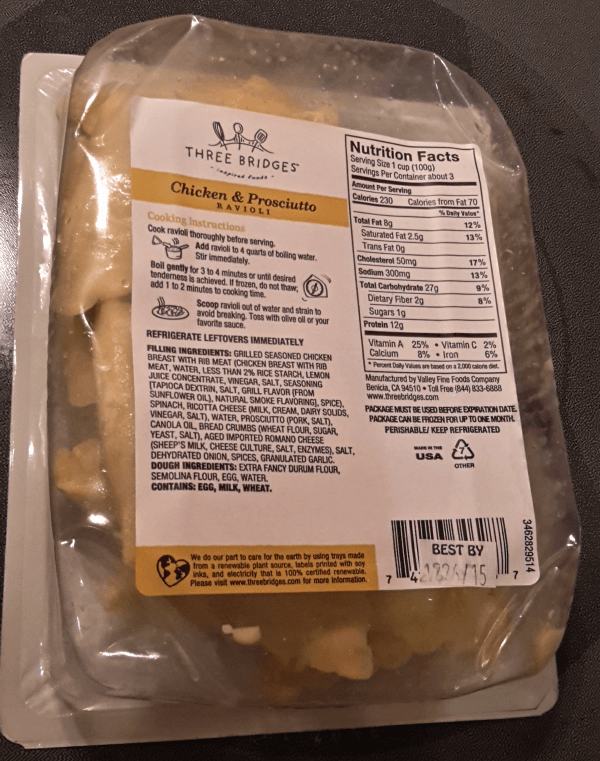 You can also find Three Bridges choices for special dietary needs and preferences, such as their organic cheese tortellini, organic spaghetti, organic fettuccine, gluten free five-cheese ravioli and gluten-free butternut squash. Three Bridges goes the extra mile in terms of operating in a “green” fashion. They use soy ink on their labels and paper-based packaging. The company makes their trays from a renewable plant source. Three Bridges generates their own solar power to cover over a third of their annual electric needs. That’s almost like removing 94 cars from the road – preventing 1.1 million pounds of carbon monoxide release in the first year alone. The company offsets the rest of their power use with certified renewable energy. You can find Three Bridges products in the refrigerated section of many grocery stores as well as most Target stores.